Sherp is the ultimate all terrain vehicle that promises to take you anywhere - be it mud-filled terrain, snow, or even water. All-Terrain Vehicle (ATV) is a special designation reserved for the most rugged of automobiles. Whether you’re a farmer working in the unforgiving terrains, or you’re simply a lover of extreme adventures, ATVs are your go-to vehicles whenever you’re in need of exhilarating off-road experiences. With its uncanny ability to tackle virtually any terrain, Sherp might just be the best ATV ever invented. Sherp is able to mount obstacles, navigate mud-filled terrains, transition from water to ice, move while buried in snow, and can even swim. This four-wheeler promises to take you anywhere, and you can take that literally. The beast of an automobile could easily be mistaken for a Tonka Toy. At less than 3000 pounds, it weighs significantly less than a regular car. 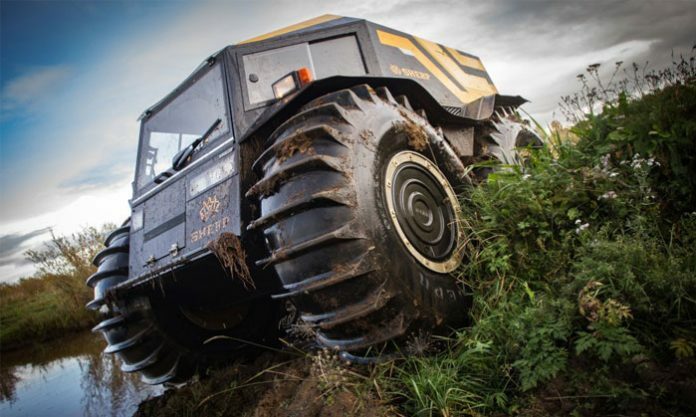 The most eye-catching feature of Sherp is perhaps its gigantic tires. The tires manage to look bigger than the whole vehicle and they’re unlike anything you’ve ever seen in any vehicle. The self-inflating nature of the tires empowers Sherp to mount obstacles as high as 2.3 feet! Whether it’s a boulder, debris, fallen tree or any other obstacle that’s between you and your destination, you can trust the Sherp to take you wherever you wish to go. A 44hp, four-cylinder Kubota diesel engine is responsible for supplying all the power Sherp needs. The vehicle comes with a 15.3-gallon fuel tank that houses enough fuel to power Sherp’s engine for a full day, according to the manufacturers. If your adventure would be taking you the extra mile, Sherp’s complementary fuel tanks would come in handy. Predictably, Sherp is not a very fast vehicle. It can only manage a maximum speed of 24.5 mph even when in top gear. On water, the top speed reduces to a meager 3.7 mph. Thankfully, the terrains Sherp was built to navigate aren’t places you’ll want to cruise through at top speed. And Sherp only promises to take you anywhere, the manufacturers didn’t mention anything about getting you there fast. And it can float too! Sherp truly lives up to its all-terrain billing with its ability to move on water. Each of its huge tires has a volume of 210 gallons, giving it a displacement of more than 7000 Ibs. The result is a vehicle that’s capable of acting as a boat whenever you need one. Sherp’s hermetic body makes the interior and engine compartment waterproof. Perfectly suited for even the worst conditions, Sherp is no doubt the ultimate ATV. There is a report of a Sherp getting stuck in Texas clay, under a truly grueling condition. But you’ll hardly see any other four-wheeler come close to navigating such unforgiving terrain. Sherp is currently priced between $65,000 to $70,000. You can visit the official website to find a dealer near you if you wish to become a proud owner of a Sherp.